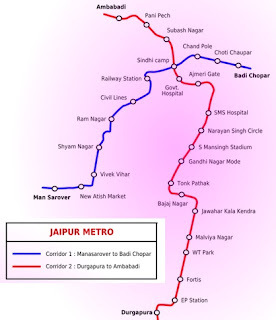 Jaipur Metro rail inaugurated by Rajastan Chief Minister Vasundhara Raje today, 3rd June 2015 and metro rail services started for public from today in Jaipur. Completed nearly four-and-a-half-years, the Jaipur metro is touted as one of the fastest-built metros in the country. 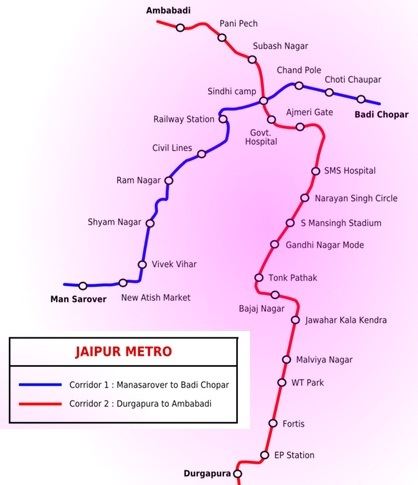 The 9.63-km elevated section of the Jaipur metro with nine stations and built on standard gauge connects the city's residential area Mansarovar to business hub in Chandpole. The line is expected to ferry approximately 1.2 lakh passengers daily. A total of 10 four-coach trains will be making 131 trips each day between the two terminal stations at a frequency of 10 minutes in peak hours and 15 minutes in off-peak hours. Normal operations will begin from 6.45 am and will continue till 9 pm. Fare for the 9-km metro stretch will be in three slabs of Rs 5, Rs 10 and Rs 15. Right from the beginning of her second term in office, Chief Minister Raje had disapproved of the implementation of the metro project, a brainchild of former chief minister Ashok Gehlot. The 12-km east-west Metro corridor was one of Gehlot’s big ticket projects that he had expected to flag off by the end of his tenure.